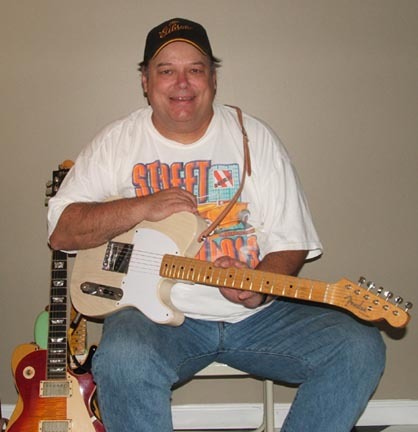 Bill Hullett has made his living with his guitar for the last 40 years. In one 10 year span alone he played on over 5000 sessions. He has recorded with dozens of Legendary artists including George Jones, Merle Haggard, Marty Robbins, Tammy Wynette, Keith Richards and Alabama. He has performed live with the likes of Aaron Neville, Michael McDonald, Chet Atkins, Shania Twain, Vince Gill, Bo Diddley, Keith Whitley, Sam Moore, and on and on and on. If you see an old panel van parked at a recording studio in Nashville, you can pretty much bet you will find Bill Hullett inside playing guitar and writing some of the prettiest charts in Music City, USA. Bill Hullett: Well in terms of birthplace, its Galveston, Texas. When I was 11 we moved to San Jose California and thats were I got bitten by the guitar bug. First because of the Ventures and Beach Boys but then once the Beatles came along that was it, I was hooked forever. In California in the sixties there was literally a garage band on every block of every street in town. 1000's of them! By around 1966 I started listening to C&W too. I loved Buck Owens and a year or so later Merle Haggard came along. I really loved that they both used Telecasters and the whole Bakersfield sound, also the really early Waylon stuff really impressed me, Wayne Moss on guitar was a killer!!!!!! Bronson: How long have you been playing music as a Pro? Bill Hullett: My first Paying gigs were playing at high school dances. 1964 would have been the earliest, but as far as making a living playing I've been really blessed. I got out of the Navy in early 1972, my wife Debbie quickly learned bass, and we played 6 nights a week in C&W bands in California prior to moving here. So really the only "normal" job I ever had was the Navy. I've worked my whole life (so far :-) playing guitar. Bronson: Do you prefer playing in the studio or performing live and why? Bill Hullett: I remember getting chastised by a 9th grade guidance counselor to give up this silly music stuff, and I told him then that there were guys that did nothing but play on every ones records and that was what I was gonna do. He rolled his eyes!! So I've always wanted to be a studio guy. I don't even know at that age how I knew of that career but I remember that it was always in the forefront of everything I did or thought about. Bronson: Give a brief break down on the instruments and gear you bring to a session. Bill Hullett: If its acoustic, I usually bring the Martin, along with an old 1965 Epiphone Texan (just like Paul McCartneys! :-) a resonator guitar (a tri cone) and a Rodriguez Gut string. Occasionally I'm asked to bring an old Guild 12 string that I have, but not very often. If its an electric session I usually bring a variety of amps that my son Clay (that 18 month old, grew up to be a great amp builder, and guitar/bass player) has made for me. The two that I'm fondest of are a 4/10 tweed bassman clone, and a tweed deluxe clone, most of the above mentioned electrics and sometimes a goofy instrument like an electric sitar. If I'm pulling double duty then I have to make sure all of these things get to a session. Bronson: What do you find is the biggest difference between playing on a demo vs's a master session? Bill Hullett: The biggest difference (at least now a days) is that Masters are not as experimental as they used to be. I guess its the high cost involved, but in reality I've come home very excited about playing a demo that I knew was gonna be a hit and we built a cool arrangement from the ground up. That used to be the case on masters, but not so much anymore. I wish it were back to the old way. Bronson: What was your first master session in Nashville and who was the Producer? Bill Hullett: I have to give credit to Pete Drake for getting me started playing sessions. I met him within about a month of getting here and he was kind enough to let me watch his sessions and hang out and meet everyone. About a year later of hanging out about 60 hours a week he hired me on a Pepsi jingle and from that point on he hired me on everything he produced for about the next 6 years. He was producing about 1/2 of the Opry members back then so I got to play with legends that I never would have had a chance to other wise. Ernest Tubb, Justin Tubb, Billy Walker, Jan Howard, The Wilburn Bros, Charlie Louvin, just exceptional breaks to give a newbee. He also got me on Billy Sherrill sessions , recording with people like George Jones, Merle Haggard, David Allan Coe. He propelled my career much faster than I ever could have on my own, and I'll always owe him a lifetime thank you for that. Bronson: How many master sessions have you have played on and does any one stand out? Bill Hullett: I couldn't begin to estimate how many masters I've gotten to do, I never really kept them in categories like that, but i do know that I was doing between four or five hundred sessions a year for about a ten year run. Those were exciting times but the pace will wear you down after a while. My life is a little less hectic these days. Bronson: Is their any one session or live performance that you feel made the most impact on your career as a professional musician in Nashville? Bill Hullett: One session, no, but there have been artists that I've played for that I was really honored to be a part of what they did. Marty Robbins, Vern Gosdin, B.J. Thomas, Martina McBride, Tammy Wynette, Charlie McCoy, Pam Tillis, Radney Foster, Leeroy Parnell. I really don't want to leave anyone out and I'm barely scratching the surface. I'll just add that every session is a real blessing and I find joy in all of them. Bronson: Name 3 Artists who's music you feel challenged you the most as a musician. Bill Hullett: I'll change this question a little and name you three producers that I felt most challenged working for because thats where the rubber meets the road. First was Pete Drake, I was young and dumb and wanted to please so I hung on every word. It was like going to college working for him, he knew how to cut records! Hanging with Al Pachucci, his engineer (former RCA engineer for everyone, including most of the Elvis sessions) was the best. He's a salty old guy, now retired from the music bizz but he knew his craft and didn't put up with anyone who wasn't there to get serious and work. I loved him! Second was Billy Sherrill. He might have been the best producer this town has ever seen IMHO. A genius, he knew exactly what he wanted, but was open enough to hear a new idea, and would immediately give you a yea or nay. Not any "I don't know, whatta you think?" His engineer, Snake Reynolds, to this day is the best engineer this town has ever produced! He's so good its scary. These were people who just by their expertise forced you to give 150%. The toughest guy to work for was Bob Montgomery. I always played acoustic for him and he would feature the acoustic quite often. He was so much of a stickler on tuning that I literally would come home and practice tuning! I'm so glad to have had that degree of craftsmanship asked of me though. He really made me a much better player because of it. Bronson: Of the musicians that you haven't played with, who would be the one you would most like to pick with and why? Bill Hullett: I've played with just about every session hero I've ever had. The only ones that I could add to the list would be Eric Clapton, Jeff Beck, and Billy Gibbons.